Hello. My printer is Samsung ML-1865. 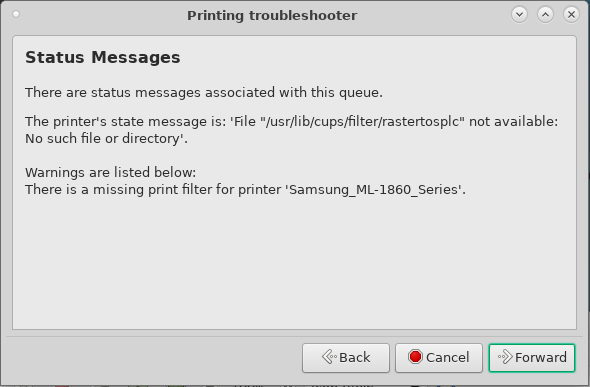 When trying to print something, I always get error 'File "/usr/lib/cups/filter/rastertosplc not available: No such file or directory"'. I've done a bit searching for the rastertosplc filter on the web and I was unable to find anything related to this filter, it looks as if it is a bug or error that cups is even asking for it. I've tried installing https://aur.archlinux.org/packages/sams … ed-driver/ and https://aur.archlinux.org/packages/sams … 860series/ but none of those seem to provide this filter. So what do I do? Where can I get it? You do not say how you have installed your printer. Manifestly there is a bug in your installation. Note that each driver has its own files. If you want to try the AUR package, you have to reinstall your printer. To install your printer (and to debug problems) use the CUPS interface directly (point your browser to http://localhost:631 ); it is less error-prone that the tools provided by your desktop. The printer was installed through the cups web interface. And reinstalling the printer the same way truly did the job. Now it seems to be working all right. Thanks!